Old School Chopper Builds From The 70's! 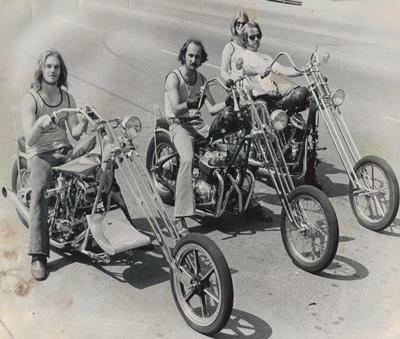 Here are 3 choppers we built in the late 70's when I had a shop in Bellflower, CA. The front one is a shovel. The air spoil in the front was a levered oil cooler, and the center hxacon tank was used for nitrous (i.e before o.c.c). The back one was a panhead and the center one was a 750cc Honda, the springer front ends were our own designs. All 3 bikes and custom pipes were also our design the front wheels on the pan and the shovel were ours also. O.C.C WAS NOT THE FIRST TO BUILD OUTRAGES BIKE'S. THESE ARE MORE WHAT JESSE WOULD HAVE BUILT IF HE WAS BUILTING BACK THEN. Comments for Old School Chopper Builds From The 70's! Just a short comment of five words. 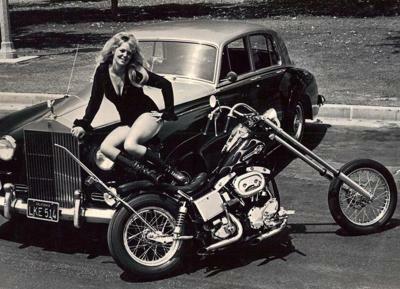 Seventies choppers are the KOOLEST!!!! Lets not forget the women of the time as well!! ANYONE could outbuild OCC with a discovery channel budget. There are still guys pounding out springers over fire, and putting 4 speed trannys on sporsters. Innovation is everywhere, you just can't see it until it wants to be seen, and you will never see it on TV. Bolt on mods have never counted as innovation. I, personally, put kawasaki brakes on my '67 shovel chopper so it wouldn't stop at the Harley dealership, and any parts that said "HD" on them were removed and sold at the local swap meet for twice what they were worth!